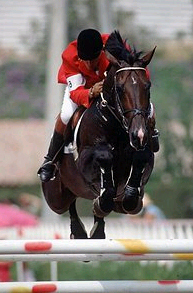 Darco with rider Ludo Philippaerts at the Olympic Games of 1992. 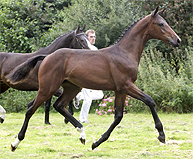 Sires and Grand Sires have already produced many top quality jumpers and stallions like Ottorongo, Parco, Indoctro, Cassini, Roderik, Cardento, Landgraf and Lord. Also the dam-line brings the necessary jumping genes. This Holstein line 318D2 has also brought the stallions Corofino and Coriano, who both have jumped internationally. Also three full brothers out of Douglas’s great-granddam are approved stallions, they are: Lido, Leonardo and Lekar, last both did S-jumping. 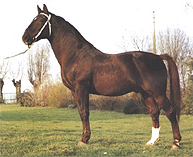 Next to that Lido was an important sire and also a famous Event horse. 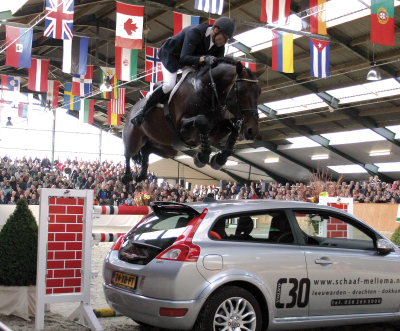 Douglas did his stallion test in Adelheidsdorf as a 3 year old, he became 1st in jumping with 139.49. He received for the several jumping parts a 10 - 9.3 - 9.3 - 9.5. 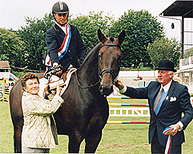 As a 4 year old Douglas was the Champion of Ireland of the 4 year old jump horses and he also won the young horse jumping class - 4 times! Also when he was 5, 6 and 7 years old he was a finalist at the Irish Championships. 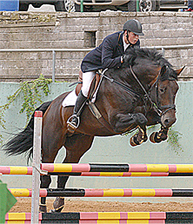 When he was 6 years old he became reserve Champion and as a 7 years old he won the first qualification and he placed two times, once a 3rd place and once a 5th, all of this at the Guidam League of Ireland. This year Douglas competed successfully in the international 1.40 m/ 1.50 m classes with rider Conor Swail, he was 2nd and 4th in Dublin, 2nd in the B&R 1.40m Grand Prix, 3rd in the Dunlaoghaire 1.50 m Grand Prix and 6th In the Rolestown 1.40m Grand Prix. Douglas has an unlimited scope and the best technique. Now, the first offspring of Douglas have already settled in at stables of International riders and horse-traders. They jump with extreme much scope, technique and quality. Douglas: a combination of the best Belgian and Holstein lines.